Past and current employees of certain LGBTQ social service agencies report patterns of discrimination relating to the agencies’ employment practices. 4A Testimony was provided by many regarding concerns over employment practices, employee compensation and the adequacy of services being provided to LGBTQ people of color at the Mazzoni Center and Philadelphia FIGHT. 4B Review of the employee handbooks and employee policies of Mazzoni Center and Philadelphia FIGHT reveal they are inadequate or not properly implemented and leave employees vulnerable to discriminatory practices. 4C Employees who speak out about experiences with discrimination and mistreatment feel too intimidated to report their experiences or fear retaliation for reporting. 4D Boards and leadership of many LGBTQ social service agencies are not diverse and a few members sit on multiple boards. The Mazzoni Center has extremely thorough employee policies regarding anti-harassment, inclusion, retaliation and work rules. Many current and former employees reported to the PCHR that the policies for reporting discrimination are not fully implemented, thereby rendering them ineffective. 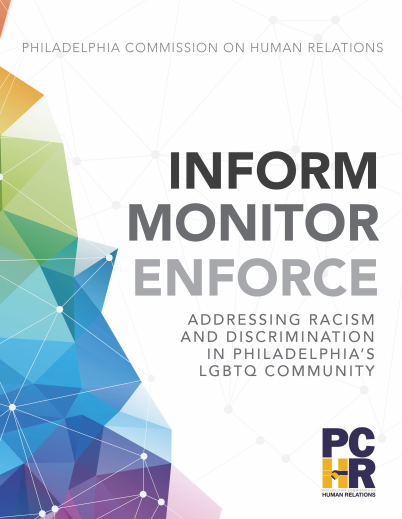 Philadelphia FIGHT has a general handbook and/or employee policies to protect diverse employees, but does not have language specifically addressing racial and LGBTQ discrimination. FIGHT does not specifically address the different types of possible misconduct and discrimination. However, it does have detailed procedures for reporting incidents of harassment and violence.